Malcolm Turnbull’s recent announcement of his support for a regional fast rail network was a welcome contribution to the high-speed rail debate in this country. One of the key planks of his announcement was to focus on a “value capture” funding model, whereby the government would recoup its investment into the rail infrastructure by “capturing” some or all of the increased land values caused by the fast train. Careful Malcolm, that way danger lies. “Value capture” is one ill-considered soundbite away from becoming “value theft” in the public mind. 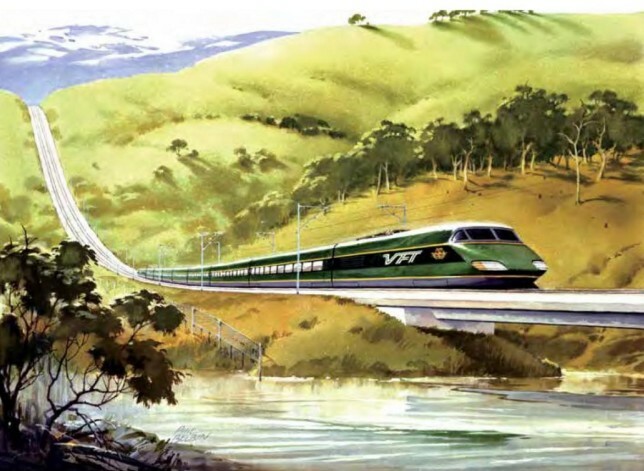 Value capture must indeed be part of the funding model for any realistic high-speed rail proposal, but ham-handed efforts to explain it to the public have doomed high-speed rail projects in Australia before. Turnbull’s announcement marks the first time high-speed rail has had actively bipartisan support in this country, and also a clear majority of public support; it would be a shame to waste this opportunity and have public opinion turn against HSR on the back of fears about the funding model. 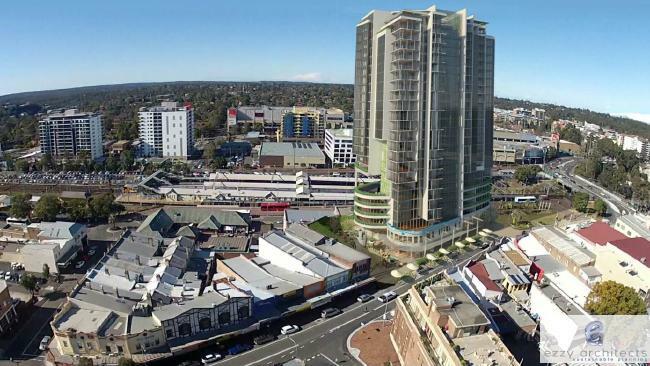 Real-estate developments, such as this residential tower proposal near Hornsby Station, can be used for positive value capture strategies. Image: Ezzy Architects via The Daily Telegraph. Wikipedia’s definition is simple and intuitive: Value capture is a type of public financing that recovers some or all of the value that public infrastructure generates for private landowners. The concept also applies to privately funded projects that generate external benefits. Basically, anything that takes positive economic effects that lie outside the balance sheet of the project and put those benefits inside the balance sheet. Typical examples include a capital gains tax surcharge or increased land tax for all properties within a specified area. It can also include “passive” value capture, where no special taxes are levied but the general increase in land values and economic activities results in increased bracket creep and increased taxation receipts. This is “zero-sum” or “negative” value capture: the developer’s gain is the private landholders loss. Negative value capture is a sure-fire political suicide vest, guaranteed to associate high-speed rail with increased cost of living. Even if you were proposing to fund construction with 100% public funds (which Hot Rails does not support), to link the project so explicitly with increased living costs is a spectacular marketing own-goal. The entire psychology of “Value capture” is wrong-headed – it evokes theft, the taking of un-earned value. A better strategy is to adopt a “value creation” strategy, where the developer (government or private) directly creates, and owns, the value created by the fast train. This is “positive sum” value capture, where both the developer and surrounding landowners all win. A typical example would be developing a medium-high density residential and shopping district in the vicinity of the train station, possibly also with the developer awarded air rights to build multi-story complexes. While regional development is sure to generate plenty of its own debate, it at least frames the rail developer as a creator of value, rather than a captor of value. This is as it should be; a high-speed railway would be the single largest economic stimulus to regional Australia, since the first railways in the late 1800s. As I said, these proposals are sure to generate plenty of debate too. Regional fast rail will require the co-operation of all levels of government in order to ensure such development is socially, aesthetically and environmentally appropriate. Achieve this and public support will be overwhelming. It is value creation, not zero-sum value capture, that is the best way to increase a fast-railway’s revenue beyond mere ticket sales. The failed Very Fast Train Joint Venture of the late 1980s and early 1990s provides a cautionary tale of the perils of mis-selling the public on value capture. In 1990, the private consortium proposing the railway briefly considered the worst form of negative value capture – a capital gains style tax on landowners near the railway. Many of these landowners already had concerns about the railway due to environmental or noise issues, and the prospect of being taxed in addition to this came as a slap in the face. The public backlash was intense and lasting. The consortium quickly backed away from the suggestion, saying the tax was merely an idea for discussion, but the damage was done. The public perception was now that the VFT was out to take your money. Even when advocating positive value capture, also keeping the public narrative positive is important. This is another aspect where the VFT failed. After the debacle of the tax suggestion, it was soon reported that the consortium was planning to develop shopping centres and residential precincts at the fast-rail stations. Without a positive articulation of this vision from the VFT consortium, a negative portrayal took root. It was suggested that the VFT was just a disguised real-estate development project, rather than a genuine mass-transport proposal. Rather than take hold of the narrative, the VFT went into damage control, denying allegations of a property-development focus despite studies suggesting that the railway itself would, at best, barely cover costs. The consortium should have instead publicly embraced development as an essential funding model that would allow the railway to be built at no net cost to the taxpayer. But they failed to do so, and now the public thought the VFT was going to take their money and make a bunch of spiv property developers rich at the expense of everyday Australians. The public narrative was lost. After the collapse of the project in late 1991, the proponents of the VFT maintained that it would have been a financial success. We’ll never know, of course, but if so, positive value capture would have been an essential part of the business plan.. It is hard to imagine now, but in the late 1980s the the VFT project was considered almost inevitable; much contemporary media coverage was of the form of warning that so-and-so might threaten the VFT project, or that such-and-such might be damaged when the VFT was built. There was a real sense that the project was happening; and yet the apparently minor matter of promoting negative value capture versus positive value capture turned public opinion against the project. It’s tragic, really. Had things gone better in the early 1990s, Australia might have deployed high-speed rail by 1995 and been the sixth country in the world to do so (after Japan, France, Germany, Italy and Spain). Instead, here we are a quarter century later and the train from Sydney to Canberra still takes over four hours to travel a distance of less than 250km as the crow flies. Intercity rail is currently all but irrelevant, yet its promise for regional development remains as strong as ever. The current bipartisan support for high-speed rail is very encouraging; it would be a shame to lose public support by repeating the errors of the past. budget, financing, public opinion, Sydney, VFT. Bookmark.